The Department of Environment and Natural Resources in Region 12 (DENR 12) last week approved the application of an international wildlife protection group to conduct research of the newly discovered tarsiers in Mt. Matutum in South Cotabato. DENR 12 Regional Executive Director Alfredo S. Pascual on January 20 signed the Wildlife Gratuitous Permit allowing the Endangered Species International (ESI) to collect and study the tarsiers in the area of Mt. Matutum Protected Landscape (MMPL). The permit numbered RXII-2011-001 is valid for one year. ESI is a nonprofit organization headquartered in San Francisco, California, USA. It is strongly committed in reversing the trend of human induced species extinction, saving endangered species, and preserving their vital ecosystems. “We also plan to establish a core conservation center at Sitio Bagong Silang in Linan, Tupi, South Cotabato to better protect their habitat and to prevent the tarsiers from total extinction,” Fidenci said. Locals have been reporting about the presence of Tarsiers in Matutum but no documentation and study has been conducted yet. ESI’s interest in conserving the tarsiers in Matutum started during his first visit here in Gen. Santos City in 2008. “I learned from the locals about the tarsier, however, despite the efforts to capture one, I was not able to see the same personally at that time,” he said. Surveys for tarsiers will involve walking transects (straight paths cut through the forest) at night using torch light locate tarsiers. Tarsiers do not have this reflective layer so locating them is more to do with the luck of intercepting them along a transect. Tarsiers will be captured through a mist nets and will be fitted with radio transmitters and will be tracked for two months. Non radio tagged tarsiers will be marked with colored plastic rings fastened around their elongated tarsius. In 2009, the indigenous people of Sitio Bagong Silang in Linan, Tupi, South Cotabato captured one tarsier along with three grass owls. This led to the discovery of the tarsier sanctuary in Linan. There, one can find the tarsier anytime of the day in the wild. The habitat, however, was clearly disturbed because of human pressures as evident by deforestation and conversion of forest lands into agricultural use. Getting interested in conserving the tarsier habitat, Dr. Fidenci applied for a permit to conduct research about tarsier’s habitat and, to save the smallest primate from total extinction. 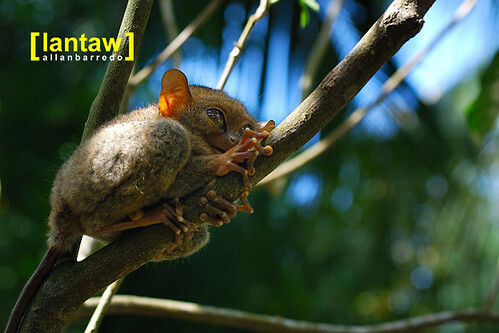 Philippine tarsier is one of the Philippines’s primary flagship species for conservation. But, very little is known about its taxonomic diversity and conservation status and surveys are urgently needed throughout its range including Mindanao. The International Union for the Conservation of Nature (IUCN) currently lists the specie as "Data Deficient" or "Near Threatened." Currently all populations are considered to belong to single specie (Tarsius syrichta). ESI will also study the status of frog species including the endangered Mindanao horned frog in Mt. Matutum. At the forefront of biodiversity conservation, ESI conservation programs are measurable, concrete, positive, scientific, educational, apolitical, sustainable, and beneficial to indigenous people. Past and current projects are mostly located in North and Central America, Central Africa, and South East Asia.